Combat cold and increase stamina. Foeniculli Fructus, Isorae Fructus, Caryophyli Folium, Zingiberis Rhizoma, Mint Herba, Phyllanthi Herba Extract, Valerian Root Extract, Echinacea Extract, Ginseng Extract, Fruktosa, Sukrosa, Honey. 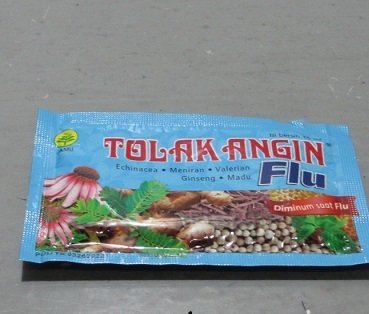 - Take Tolak Angin Flu directly from the sachet or with half a glass of warm water. - One sachet, three times a day after meal. - Contact physician if not getting well in three days. - Take good sleep with healthy food. - Can not drink with alcohol or other sedative drink, caffeine, medicines with effect to block blood. - Not for pregnant women and child. One box (contains 12 sachets @ 15 ml).